You are here: Home / Blog / General Marketing Tips / What Are Your Clients Worth To You? The title tells you all you need to know, and as soon as you begin to notice just how straightforward this idea is, and how it can assist you with achieving your aims, you will start to question why it is not as popular as it should be with other company owners. When it comes to figuring out the LTV (Lifetime Value of your Client) you need to consider the total amount of profit that you gain from the average client during their time with your company. So how does this number help you to plan ahead with more accuracy? The answer is simple. By merely understanding the true net worth of each client to your business, you can easily figure out just how much financial outlay is required to convert a prospective client in to a paying customer. This will also ensure you put the right emphasis on customers that you need to have. Say you have a client who spends $450 the very first time they do business with you, and then spends the same amount of money again 6 months later. 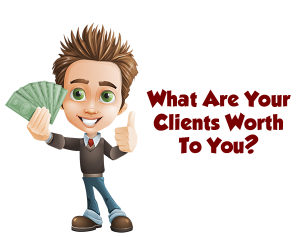 During that 12 month period, that client has spent a grand total of $900, and that is what that client is worth to your business. Lets then say that the client uses your business twice per year for a total of 5 years at $450, which is a total spend of $4500. The next thing you need to do is to figure out how much of that $4500 is profit. For this example, we will say that it is 30%, so that is a total of $1,350 of profit from your average client for the 5 years. 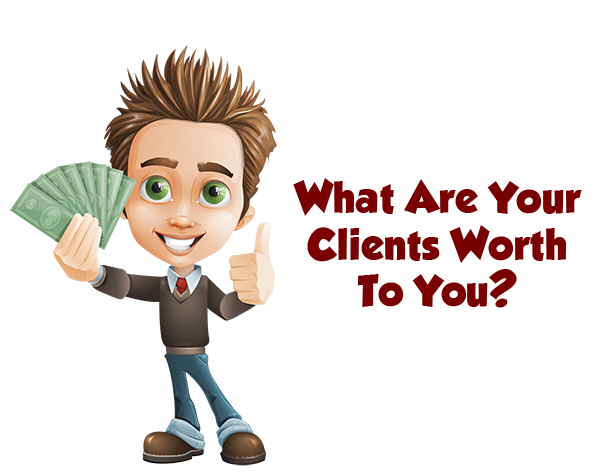 With a bit of luck, you are beginning to see how this figure can help you with the amount of money that you need to spend on marketing. A referral can make your client even more valuable to your business, and if your average client is able to attract a new client to your business, that profit of $1,350 will double, without the need for you to spend any money on advertising in order to attract that client. Begin to figure out the lifetime value of your average client, and make the raising of this value a primary goal. Methods that you can use in order to achieve this are to prompt your clients to refer your business more often, encouraging repeat custom and selling more products or services.